The great thing about using your personal name to brand your bicycles is that it gives you plenty of freedom. And that’s because to the marketplace your name means nothing until you make it mean something. It’s a blank slate. 40 years ago the name Richard Sachs or Bruce Gordon meant nothing in the bicycle world because they had just started building. Now of course, after 4 decades of building beautiful machines, those two names are synonymous with brilliant handmade steel bicycles. I’d love to have that blank slate because it would have taken the pressure off of coming up with a name that resonates and has appeal for the marketplace. (As soon as you don’t use your name, you have to have a reason for using something else.) In the bike world Matthew or Matthews is well trodden ground, as is James. And Mowat, while rare and having a great history, is kind of an unfriendly sound when it’s pronounced correctly (the first part sounds like MAO—as in Chairman Mao (rhymes with Ow! ), and then you simply add an “IT” on the end). Say it out loud a couple of times and you’ll see what I mean. It’s kind of a harsh sounding word with a couple of really hard syllables. At times it can sound a bit like a modified duck quack. I could probably sell it a bit better if I had a Scottish brogue like my cousins or my grandfather. Oh, well. I talked with a few of my friends about my dilemma and more than one of them told me that I needed a name that reflected my love and passion for bicycles and riding. When I came across Paramour it felt right because what better way to encapsulate that passion than by calling a bicycle a mistress? It certainly applies to me—the bicycle is something that I will never tire of, it almost always has at least some of my attention, I love spending time with it and, truth be told, I feel better about life and all that comes with it when I’m riding one. What a great mistress. Plus with a name like Paramour it’s license to use plenty of red (one of cycling’s great colors) and sprinkle in a heart or two for a graphic element. I can even throw in a few hugs and kisses (xoxo). And I get to talk about love, passion and dedication—some of the first words that pop into my head when I think about cycling. I could go on. 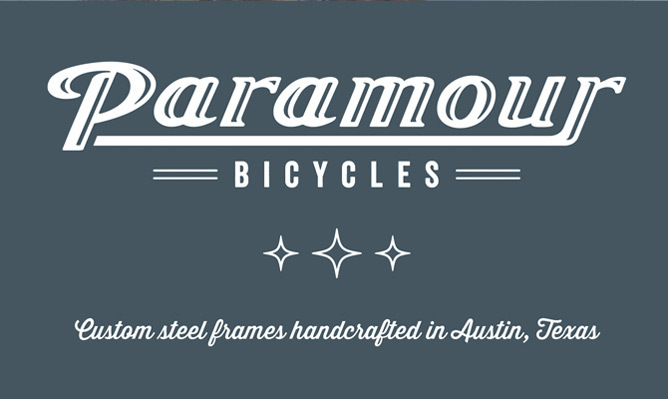 So, Paramour Bicycles it is.